When selecting directional controls for pneumatic valves, it is important to consider basic valve design. Poppet-types elements can accomplish the sealing function of a valve. Shear-action valves can control the flow by using parts that slide across flow paths. For this process, four basic types include packed spool, lapped spool, packed bore, and sliding plate. For the sliding plate variant, the disc uses unbalanced pressure to force mechanisms to seal against mating surfaces. The goal is to control air flow from the desired port while sealing flow from others. Designs are constructed in 2, 3, and 4-way action. Other types of valves (shear-action) incorporate spools for moving parts. In most cases, a spool will stroke against a metal bore. A packed spool value is strong and has resilient seals that are fitted around spool lands: to create close to leak-proof sealing. A packaged-bore pneumatic valve is another common directional valve. It has metal spools that work with bore fittings. It is paired with several stationary seals, which create isolation between ports. A lapped-spool valve is frequently referred to as a shear-action type. For this design, it mostly depends on the ability for a close fit between the bore and the spools (without using seals). The purpose of this design to allow for better control of air that is flowing between ports. This design is popular because it does not create bubbles, as a result of the tight seal. For more information on acquiring the right pneumatic devices, please give us a call. 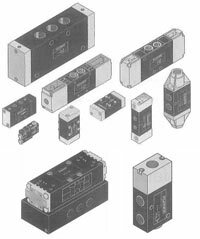 We carry a full line of pneumatic times, pneumatic indicators, and more.